Order this plant now and it will be shipped on the week you select when checking out. By ordering now you get priority access to rare and limited varieties that may be sold out later in the season. (Morello Anise Hyssop) Pollinators love Agastache ‘Morello’ for its dense spikes of deep burgundy rose flowers filled with rich nectar. Unlike many anise hyssops that prefer dry conditions, this adaptable perennial even thrives in the humid East and Southeast. This plant is easy to grow in a variety of conditions. This icon indicates that the plant you are considering -- although beautiful and rewarding -- often is challenging to grow. As per our Terms & Conditions, we cannot unconditionally guarantee your success with these challenging species. At Flowers by the Sea, we understand the pleasure of succeeding against the odds. We know how good it feels to help a difficult plant thrive whether it is a diva demanding plentiful humidity and rich soil or a chaparral plant that struggles to survive outside its arid homelands. Some Salvias and companion plants need special treatment to approximate their native environments. If you live in a dry climate but love creating a rainforest atmosphere in your greenhouse, you'll find that some tropical plants are more difficult to cultivate than others. Or perhaps you are a water conservationist and want to develop a dry garden. Although many dry garden plants are easy to grow, some present difficulties, such as the need for gritty soils. Maybe you are the type of gardener who enjoys a challenge yet knows how to reach out for advice when the growing gets tough. Please remember that we're always willing to share suggestions for improving your chances of success. For more information about challenging Salvias and companion plants, please email or call us at Flowers by the Sea. We are glad to help. We believe this to be the best Deep red-tone Agastache. Some plants are just great performers in the garden. When we feel that a particular plant deserves top accolades, we give it the Best of Class designation, along with this icon. When you see this you can be sure you have found the best of its type. We do our best to keep these plants in stock at all times, but many are in high demand and availability can be spotty. This plant is patented, or a patent application has been filed and is pending and may not be propagated, under U.S. Federal Code, Title 35, Part II, Chapter 15 §161 without a license from the patent holder. (Morello Anise Hyssop) Pollinators love Agastache ‘Morello’ for its dense spikes of deep burgundy rose flowers filled with rich nectar. They never seem to stop blooming. Unlike many anise hyssops that prefer dry conditions, this adaptable perennial even thrives in the humid East and Southeast. This vigorous, rapid grower tolerates cold and heat. Morello is a cross between Cusick’s Giant Hyssop (Agastache cusickii), Texas Hummingbird Mint (Agastache cana), and Pale Giant Hyssop (Agastache pallida). Many Agastaches have a heady scent that has been described as being a combination of anise (a licorice-like scent), citrus and mint. The aromatic, deep green foliage of Morello Anise Hyssop resists mildew and turns bronze when temperatures cool. Due to its height and upright, clumping form, Morello Anise Hyssop is a fine choice for the middle of borders. Give it full sun, average watering based on local conditions, and soil that drains well. Let the soil dry moderately between waterings. Agastache are mainstays in the pollinator garden, attracting bees, butterflies, and hummingbirds. In general, they prefer mineral soils low on fertility, but Morello is adaptable to more fertile soils. At FBTS we trial dozens of new varieties, but only offer the very best for sale. We consider Morello to be tops as a deep red-tone Agastache, which is why we’ve identified it as a Best of Class plant in our catalog. We predict you’ll love it. When growing a fragrance garden, this is a good selection. Most Salvias have pleasant scents, but some are intoxicatingly fragrant. Some are short enough for border plantings that release a heady perfume as you brush against them when strolling along a path. Other taller types make good landscape highlights, particularly by doors where their scent can be enjoyed on entry and exit. Plant this herbaceous species in the USDA Zones where it grows as a perennial, returning year after year. After dying back to the ground at frost, herbaceous perennials emerge in the Spring with soft, new growth. A Salvia that is perennial in one region, may be an annual in another depending on local conditions, such as winter temperatures. If you live in USDA Zone 5, for example, Salvias in our catalog cited as growing well in Zone 5 or lower will be perennial. Those cited as doing well in Zones 6 or higher may do well in Zone 5, but generally will act like annuals coming back from seed instead of the parent plant’s roots. This plant reaches peak bloom in Fall or flowers for much of the season. It may begin flowering much earlier in the year. Bloom time for some Salvias lasts from Spring till first frost. Others begin flowering in Summer and continue into Fall. There are also Salvias that don’t bloom until late Fall and continue into Winter if grown in mild-Winter areas. There is a great deal of overlap in blooming seasons for Salvias. This plant reaches peak bloom during Spring or flowers for much of the season. However, it may begin flowering sooner. Some Spring-blooming Salvias begin flowering in Winter; others start in Spring, keep producing color through summer and may continue on into autumn and first frost. Still others flower only in Spring. This plant reaches peak bloom in Summer or flowers for much of the season. Lots of Summer bloomers start flowering in Spring; others begin in Summer and keep up the show of color until frost. Honeybees love this plant’s nectar. As a honeybee burrows down into a Salvia’s nectar-rich flowers to reach dinner, it accidentally gathers pollen and drops it on the stigma of that blossom or of ones on other nearby Salvias. Fertilization results in seed production. This plant attracts butterflies whether for nectar or as a host for their caterpillars. Some butterflies feed on a limited range of flowering plants and only lay eggs on one kind of host plant. Salvia nectar lures adult butterflies. Placing host plants, such as Milkweeds (Asclepias spp. ), next to nectar plants builds butterfly habitat. In exchange, the butterflies improve fertility in your garden through pollination. 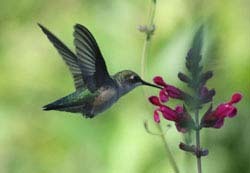 Flowers that butterflies and hummingbirds favor are rich sources of nectar. But not all nectar-rich butterfly favorites are easy to access with long hummingbird beaks. Conversely, many flowers designed by nature to attract hummingbirds don't have the structure necessary for feeding butterflies or providing a perch. 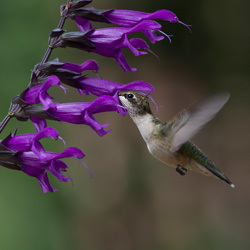 Here are ten Salvias and companion plants for backyard wildlife habitat that both butterflies and hummingbirds will enjoy. (Blue Boa Hummingbird Mint) Luxurious deep violet-blue flower spikes held over ultra-green foliage. 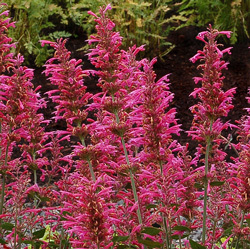 Unlike any other Agastache varieties, the flower spikes are long, wide and extremely showy. (Ava Hybrid Anise Hyssop) Raspberry calyxes support Ava's rosy-pink flowers, which whorl on tall spikes similar to many Salvias. When the blossoms are spent, the calyxes remain colorful. This long-blooming hummingbird magnet is tolerant of cold, heat and drought. (Kudos Ambrosia Hybrid Anise Hyssop) Dense plumes of flowers are accented by deep green foliage in this heat- and drought-tolerant favorite of pollinators. Kudos Ambrosia is a compact, clumping, semi-dwarf variety. The originator of this plant describes the color as creamy coconut, pale orange and light rose pink. (Kudos Coral Hybrid Anise Hyssop) Dense plumes of deep coral flowers are accented by mid-green foliage in this heat- and drought-tolerant favorite of pollinators. Kudos Coral is a compact, clumping, semi-dwarf variety. (Kudos Mandarin Hybrid Anise Hyssop) Dense plumes of creamy orange flowers are accented by deep green foliage in this heat- and drought-tolerant favorite of pollinators. Kudos Mandarin is a compact, clumping, semi-dwarf variety. (Kudos Yellow Hybrid Anise Hyssop) Flowers by the Sea is one of the first nurseries nationwide to grow Agastache x 'Kudos Yellow'. This is one of the best deep yellow Agastaches we've found, due to its large, dense flower spikes and bushy, upright form. 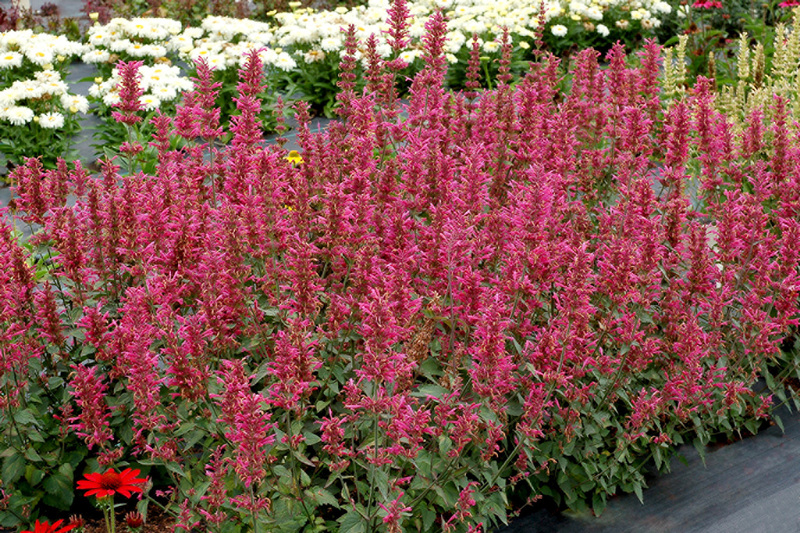 (Mexican Giant Hyssop) Bees, butterflies, and hummingbirds love the nectar of this Agastache’s tubular blossoms that may range from hot pink to the reddish-purple of Sangria. They cluster in whorls on long flower spikes above mid-green, lance-shaped foliage that smells like lemons and is tasty in tea. I was quite impressed with the packaging of my plants and that they arrived so fresh & the soil still moist. I am excited to see how they'll grow for me.